"When you enter med school, everything from undergrad vanishes and you start fresh. And that’s what Trinity gave me: a new platform to do my best in, the best environment to really thrive." This is one of the many things we love to hear from our students. The above was said by David*, a third year student at Trinity, now in his rotations in Baltimore. David is a smart, hard working student that scored a 21 on the MCAT, went overlooked by the US med school system, enrolled in Trinity's ILP program, and thrived, scoring an impressive 244 on the Step-1 exam. (As a refresher, see below for what sort of doors a score like that can open for a match candidate). One of the most common questions our admissions team is asked is, "I've heard matching is much harder for IMGs. Is that true?" Our answer is always the same. "No, it's not true." Sometimes explaining this involves first getting into the complex history of medical education standards, or the outdated view that Caribbean schools lack rigor or quality. CARICOM has gone to great lengths to rectify this with programs like CAAM-HP, and Trinity has always prided itself on the quality of its educaton, but there are still challenges to overcome. That said, it's crucial to remember that there are many, many factors that go into the residency match. We'll attempt to address a few of them in this post. First, though, we need to speak to the outdated stigma and calm anxieties perpetuated by (understandably) nervous student communities and the uninformed: while the United States and Canada are facing physician shortages, and while this is often attributed to a lack of residency opportunties, that is not entirely accurate. The demand for physicians outstrips the number of medical students produced by US medical schools, let alone the number of residency slots available (to the tune of about 4,000 extra residencies, with that gap projected to grow an additional 6000 over the next ten years). The residency slots are there; the demand for doctors is high. 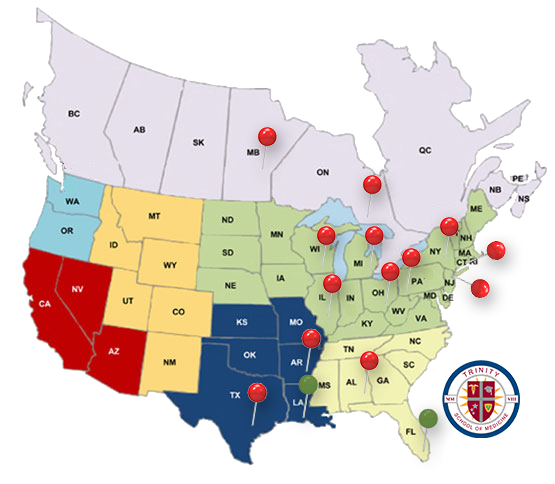 Being an international medical graduate is simply not the barrier it once was, with the American College of Physicians openly acknowledging not only the value of these students and their passion for medicine, but recognizing that the United States healthcare system actively depends on IMGs to address the medical needs of the 300,000,000 people living within the nation's borders. So, why the perception of limited access creating a physician shortage? It's more than a perception. There is a choke point, it's just the match receives too much focus; a significant portion of the issue is in the medical school admissions process itself. It can be addressed, though. The competition to be admitted to an allopathic US or Canadian medical school is very high, and one of the major factors is MCAT scores. The MCAT, a test designed to measure a student's ability to perform in medical school, is ostensibly a good thing; it helps schools get through the field of applicants efficiently and creates a barrier for people that may dream of becoming a doctor but just aren't adequately prepared or suited for it. Except there is a disparity between its effective value and its application. Don't get us wrong, it's an important metric, but it can be over emphasized and therefore too restrictive. As a result, a lot of excellent physicians don't get the educational opportunity they need to join the field and make a difference. You don't have to take our word for it. Dr. Darrell Kirch, president of the AAMC, said it himself, "The MCAT doesn't predict how good a doctor you'll be," he said. "I can point to many very successful medical students when I was a dean who had scores below that, and those [with scores] above that who struggled for various reasons." This is why Trinity looks at the entire candidate, and evaluates on a much deeper level. As a smaller school, this is a major advantage for our team and our students (more on that later). We have so many students that showed great potential with MCAT scores that were good, not great, who then went on to not only place near the top in their Step 1 scores and then proved themselves as excellent physicians. 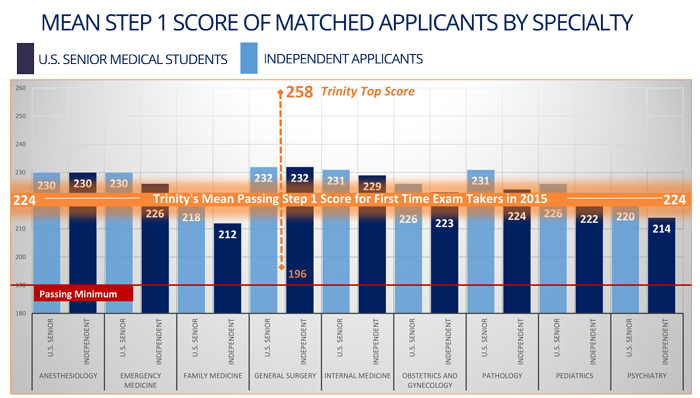 Trinity changes the MCAT from a barrier to clear to an indicator of progress: the MCAT score may be where a student's knowledge began, and it can highlight any strengths and weaknesses early on, but it becomes about how far they've come and show their capacity to grow. 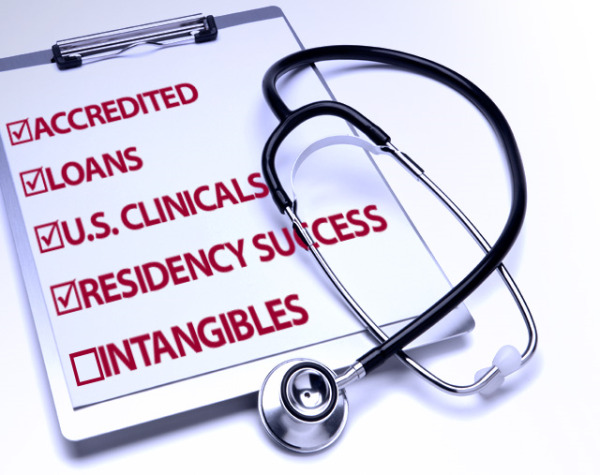 The National Residency Match Program (NRMP) surveyed residency program directors across the country about their decision making criteria and determined that the single greatest factor in assessing whether an applicant is considered is their step 1 score. Trinity aggressively prepairs its students for this with its comprehensive Step 1 prep program, as well as its curriculum of early clinical experience designed to cement classroom lessons. And it works. See the data yourself. 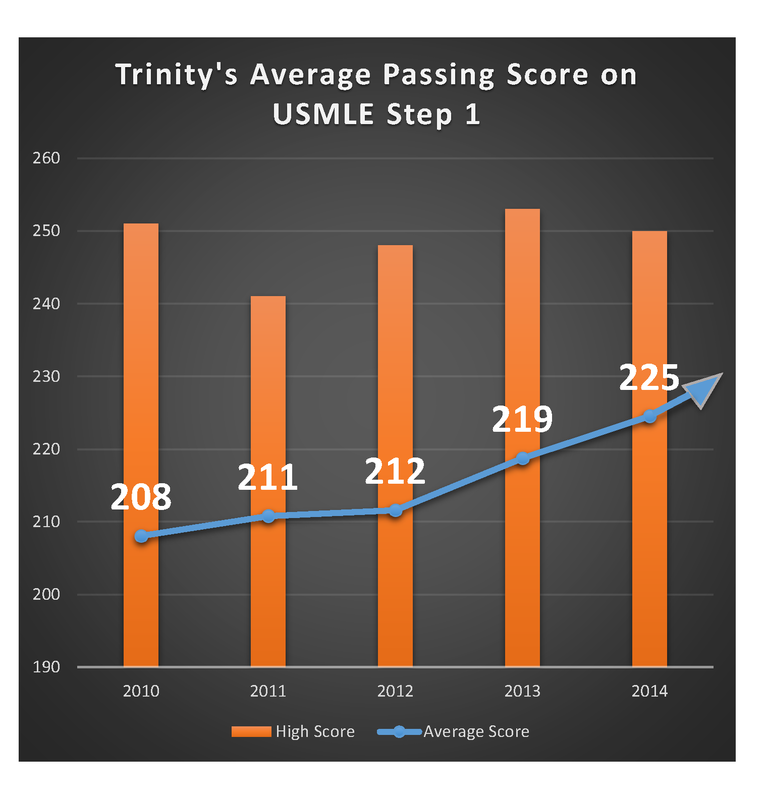 The Faculty and Administration are brimming with pride over our Students' recent accomplishment with regards to the USMLE Step 1 Exam. This week, the ECFMG provided us with results from the past six weeks of Step 1 Exam testing. Ten Trinity SOM students sat for the exam for the first time and achieved some terrific results. The combined passing scores resulted in an average Step 1 passing rate of 234. How Do You Compare MD Programs? 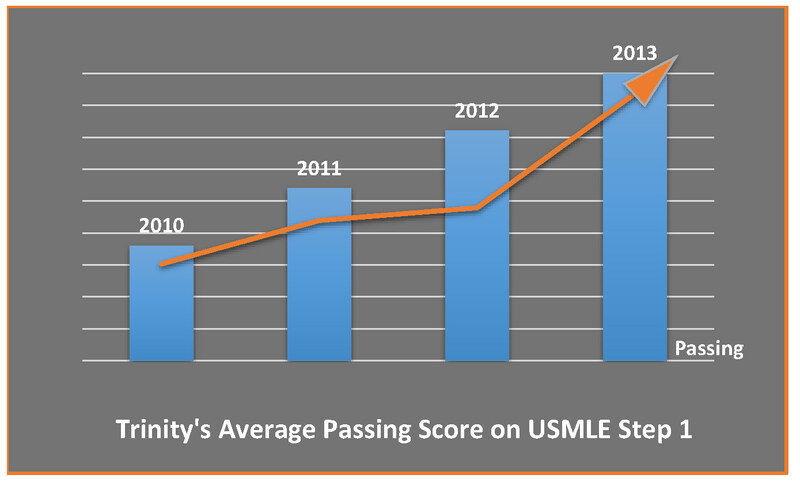 When so much of your future rides on scores earned on the USMLE Step exams, it's important to have an advantage going into test time. 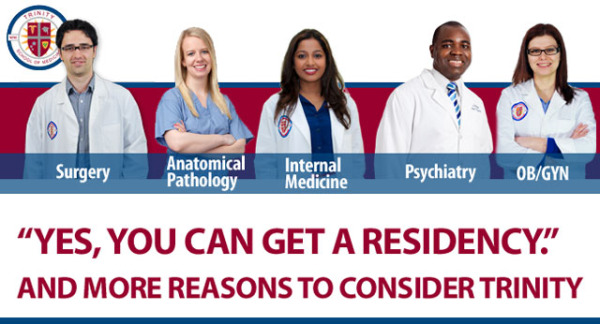 Because the competition for a Residency position includes US Medical school seniors as well as other International Medical Graduates (IMGs), just passing Step 1 isn't enough. 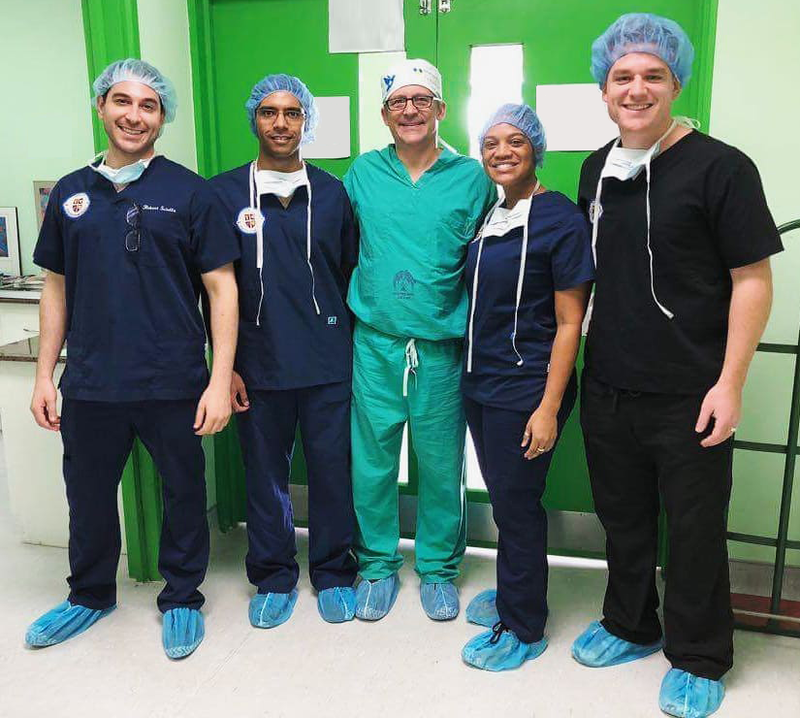 When we interview Applicants and ask them why they chose to apply to Trinity School of Medicine it's usually for the factors that differentiate our MD program from other Caribbean medical schools: Class sizes that are relatively small (from 25-75 depending on the term); clinical experience at our affiliated teaching hospital that starts in your first term; and the experienced leadership in our Dean, Dr. Skelton.